At Lake Garda are various hotel categories. You can find 5 star luxury hotels as well as little pensions. But the largest contingent are the 3 start hotels, which all offer a comparable standard. Most hotels are closed from October to mid of March except the high-class hotels. During high season some hotels at Lake Garda let rooms only for one week. You also have to consider, that in the off-peak seasons prices are much lower than in the high seasons. So have a look at the prices and maybe you can go on holiday during the off-peak season and save a lot of money. Bellevue San Lorenzo offers picturesque gardens and an infinity pool overlooking Lake Garda. It also features free parking and free wellness facilities including a Turkish bath, sauna and aromatic showers. This property is composed of 5 buildings. 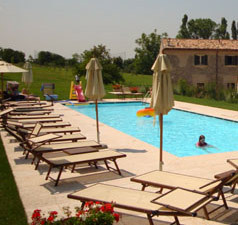 High in the hills around Garda, Hotel Poiano includes an outdoor olympic swimming pool and 6 clay tennis courts. The resort offers a free shuttle into the town centre. The Residence Piccola Italia has luxurious apartments. The location at the north western shore of Lake Garda offers an unforgettable view on the largest lake in Italy and the Monte Baldo massif on the other side. The small wellness area of the Residence Piccola Italia promises relaxation.